Before allowing your staff to use forklift trucks in your warehouse, it is important to check that they have a forklift driving qualification. This qualification will confirm that they have undergone the necessary training and are equipped with the skills and knowledge to drive forklift trucks safely. Read on for more information about forklift driver training in London. Your employees must prove that they have a forklift truck driving qualification before you allow them to operate your machinery. As a business owner, you will understand just how important it is to make sure that you and your staff are complying with relevant regulations. When it comes to operating forklift trucks, drivers are required to hold a valid certification in order to comply with the Health and Safety act 1974. Although complying with regulations prevents you from receiving financial penalties, the purpose of these regulations are to keep your staff safe in the work place. Forklift trucks are dangerous pieces of machinery and are a common cause of warehouse accidents, which is why it is paramount that your employees are trained and qualified drivers. Like with a driving test, there are two parts to the forklift truck driver test. The first part is a theory test. For this, candidates will be required to learn theory related to health and safety regulations, as well as information regarding the machinery they will be operating. For example, they will need to learn about load capacities and be able to perform daily inspections on forklifts to ensure they are safe and fit for using. 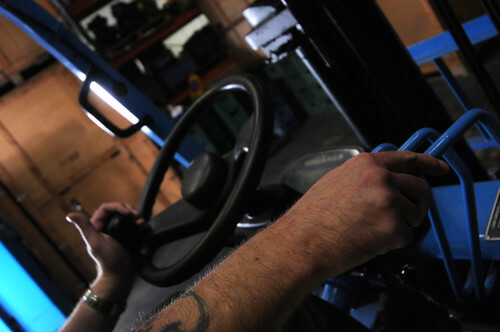 The second part of the test requires individuals to pass a practical forklift driving assessment. This will involve driving the forklift truck forwards and backwards and carrying out various different maneuvers. The practical part of the test is designed to ensure that drivers can operate the machinery safely and drive with care. The main benefit of investing in forklift driver training for you, the employer, is that you will be able to have the peace of mind that your staff are safe in the work place. As we mentioned before, forklift trucks are the cause of many work place accidents, but you can reduce the risk of accidents by ensuring your drivers are fully trained and qualified. Another benefit of investing in forklift driver training is that it will allow you to benefit from increased productivity levels. Since the forklift operators will have the skills and knowledge to operate the machinery properly, they will be able to carry out tasks efficiently and get more done in a single work day. A benefit of forklift driver training for employees is that it makes them more valuable to their employer and future employers. Forklift drivers are highly sought after by companies with large warehouses. Companies are often willing to pay a higher salary to forklift drivers that have already got the necessary qualifications, as they will not have to invest in training. We offer forklift truck driver training in London. If you are looking for a forklift driver training school in London, you have certainly come to the right place! We have over twenty years experience providing forklift truck driver training. Our extensive training programme can either be carried out at your place of work or at our fully equipped training centre in Tottenham, London. Our qualified instructors will ensure that your employees are equipped with the skills and knowledge to be able to operate and drive forklift trucks safely. They will also ensure that they have a good understanding of the relevant theory, so your employees are capable of passing the assessment first time round. For more information or to make a booking, please contact our sales team.